Something very new and exciting in improving carer engagement! Now, mental health services and community managed organisations have an App to support the implementation of the Practical Guide for Working with Carers of People with a Mental Illness. Keynote speaker at this year’s TheMHS Conference, Shannon Jaccard, suggests that the sibling community is the secret resource that could help provide stability to the mental health system. Experiences in infancy and childhood play a very important role in lifelong mental health. With 1 in 7 children experiencing mental health difficulties, this presentation will highlight the many opportunities across workforce groups to strengthen the social and emotional wellbeing of infants and children. Meeting core mental health needs using a hands-on approach to neurodevelopment: Use of the First Touch Program with Infants to level-out mental health risk factors. Deborah Lockwood from Relationships Australia SA, discusses how the simple, low-cost and culturally adaptable intervention of cue based infant massage can have a long-term impact on mental health. Queen’s Birthday 2018 Honours: Douglas Holmes, For service to community health. Congratulations to Douglas Holmes, recipient of an OAM in The Queen’s Birthday 2018 Honours for his for service to community health. TheMHS congratulates Cath Chapman on winning the Australian Rotary Health Dissemination award for her groundbreaking work ‘Cracks in the Ice’ at the Society for Mental Health Research in Canberra on December 8. 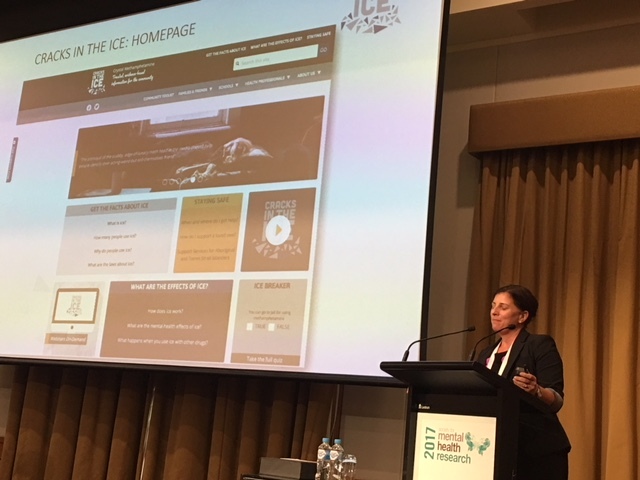 Stemming from her research on ‘Cracks in the Ice’, originally presented at TheMHS 2017 Summer Forum, this online resource has since become an innovative portal for trusted information on Ice – used by thousands of Australians, and now as the basis of a similar Canadian initiative.